USA Sportsbooks Love Tom Brady, but then who doesn’t? 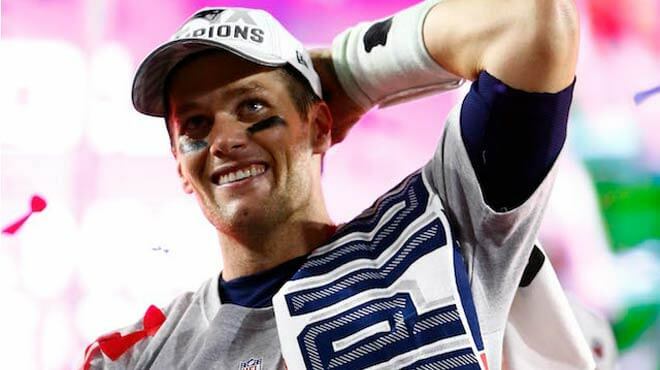 Home - Betting News - USA Sportsbooks Love Tom Brady, but then who doesn’t? USA Sportsbooks favor New England Patriots QB Tom Brady to win his third National Football League Most Valuable Player Award and first since 2010. Brady is nearing 40 years of age and when you think he has apparently exhausted his bag of tricks, the Pats go and acquire wide receiver Brandin Cooks – which may very well become Brady’s new favorite toy. Huh. That didn’t come out quite right. In the 2016 regular season, Brady threw 291 of 432 (67.4%) for 3,554 yards with 28 TDs and only two picks. In the playoffs, he completed 93 of 142 attempts (65.5%) for a postseason-high 1,137 yards with seven TDs and three picks. Oh, and he pulled the Patriots back from brink and won the Super Bowl. The 2011 NFL MVP finished 2016 with career-bests in completions (401), attempts (610) and rushing yards (369) as well as a 65.7% completion percentage, 4,428 passing yards, 40 touchdown passes, seven interceptions, a passer rating of 104.2. Additionally, Rodgers led the league in TD passes (40) for the first time, also becoming one of four quarterbacks to pass for at least 40 touchdowns in different seasons. USA Sportsbooks give the Seahawks signal-caller has the same odds as Rodgers, except that in Wilson’s case it would be his first NFL MVP Award. Wilson had career-highs in completions (353) and attempts (546) and passing yards (4,219) even though he played through injuries most of the season. On the other hand, he had just 21 TD passes compared to 34 in 2015. The 2016 AP NFL Offensive Rookie of the Year and Pepsi NFL Rookie of the Year broke Brady’s 2000-200 record for most consecutive pass attempts without an interception to start a career with 176, as well as most consecutive attempts without an interception by a rookie. He also broke Wilson’s record of games with an over 100 NFL passer rating with 11 and , and his passer rating of 104.9 broke Robert Griffin III’s rookie record of 102.4, while his 0.87% interception to attempts (459-4) broke the Griffin’s rookie record of 1.27%. Prescott’s 5.75 TD-to-Int also shattered several previous records. And so on and so forth. Rather surprisingly, Big Ben has not won this award in his storied and decorated career, though as Brady’s junior by four years, he still has time to add it to his trophy case. Then again, when you have more sandwiches named after you than Dagwood Bumstead, do you really need an MVP award? The Ice Man had the best season of his career in completion percentage (69.9%), passing yards (4,944), yards per attempt (9.3), yards per game (309), TDs (38), interceptions (7), and passer rating (117.1), all of which rendered him worthy of the 2016 MVP Award. Nonetheless, he has the same odds as a running back (Zeke Elliot) to become the first back-to-back winner of this accolade since Peyton Manning in 2009.